© 1998. Clothbound, (5.5" X 8.5") 128 pages. 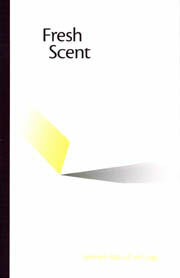 First Place, Merit Books Awards sponsored by the Haiku Society of America, for the best book of English-language haiku published in 1998. Lee Gurga, a 1998 Poetry Fellow of the Illinois Arts Council, has achieved wide-spread recognition for his contributions to haiku in English. We are pleased to share 135 of his best haiku in this collection. Lee Gurga was born and raised in Chicago, and currently lives in Lincoln, Illinois with wife Jan, sons Ben, A.J., and Alex, dog Fay, and five haflinger horses. He first became interested in haiku in 1966, but he did not start publishing until 1987. He was soon receiving awards for his haiku, and High/Coo Press published his first collection, a mouse pours out, in 1988. In 1992 he was co-editor of Midwest Haiku Anthology (with Randy Brooks). Gurga has received first place in a number of haiku competitions. In 1998 he was honored with an Illinois Arts Council Poetry Fellowship for his work in haiku. He is currently associate editor of Modern Haiku, the longest-running journal of haiku and haiku studies in English. An active member of the Haiku Society of America, he served as Vice-president in 1991 and again in 1995-96, and served as President in 1997. As a leader of HSA he was instrumental in organizing an International Haiku Conference in Chicago in 1995, and in 1997 he led a delegation of prominent English language haiku poets and editors to the second Joint Conference in Tokyo. See a more extensive profile of Lee Gurga. The heartland of America has produced its share of celebrated poets, giving us in recent years James Wright and Robert Bly. It has also given us several major figures in the first generation of American haiku poets, those who emerged into prominence in the 60s and 70s, including Robert Spiess and Raymond Roseliep. Now another midwestern haiku poet is quickly rising towards a position of equality with such luminaries. Lee Gurga seems destined to forge a fresh poetic heritage for the midwest. He has already created a body of work that captures with vivid immediacy the mystery and wonder of the region's vast spaces: the rolling prairie, the immense sky, the majestic rivers-all in the telling and suggestive few syllables that make up each of his haiku. Not only does Gurga give us the beauty of the land, he presents us with the activities of its people in such a way that their loves and strengths, their sense of God and family, and their good humor and friendliness all reach out of the poems like a warm handshake. In giving us the heart of the heartland, his haiku give us the heart of America. Empathy with all creatures is the hallmark of Lee Gurga's poems; at the same time he maintains the detachment needed to allow him to focus very clearly and directly on what he is observing. There is never any striving for effect; his language is water-clear, simple and unpretentious and one feels that every haiku moment has been experienced and every word carefully chosen. On a rainy Sunday in Santa Fe I put down a wonderful book on the development of Basho's poetics, in which I had been immersed for several days, and picked up the manuscript of Lee Gurga's Fresh Scent. How marvelous to leap from the mountains and paddies of seventeenth-century Japan to the prairies and fields of America in our own time and find another richly human heart expressed in words and images so carefully joined!